Over the last twenty years, the role of national parliaments in EU affairs has gained considerable academic attention. Much of the literature, however, has focused on parliamentary scrutiny and control in EU affairs. What tends to be generally overlooked is that the parliamentary communication function is at least as important in EU politics as the control function. Democratic legitimacy depends on a vibrant public debate on political solutions and alternatives to allow citizens to make informed political (electoral) choices and to exercise democratic control. Within the EU, it is precisely the opacity of policy-making processes and the lack of public discourse that have been defined as core problems of democratic legitimacy. Here, parliaments have the potential to provide an ideal arena for the deliberation of important European issues and thus to help overcome the much-lamented distance between European policy processes and the citizens. 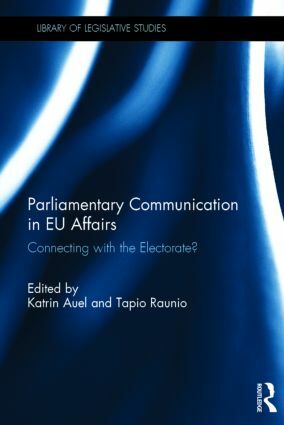 Yet, despite parliaments' central relevance for the legitimacy of European politics, the parliamentary communication function remains so far under researched. The volume aims at filling this gap by providing both qualitative and quantitative comparative data on various communication efforts by national parliaments. This book was originally published as a special issue in the Journal of Legislative Studies. Conclusion: Connecting with the Electorate in EU Affairs? Katrin Auel is Assistant Professor at the Institute for Advanced Studies, Vienna and an associate member of the Centre for European Studies at Sciences Po Paris. Her research focuses on Europeanisation, legislative studies, and multilevel governance (EU, German federalism). She is especially interested in the role of national parliaments in the European Union. Tapio Raunio is Professor of political science at the University of Tampere. His research interests include the role of national legislatures and parties in European integration, the European Parliament and Europarties, Nordic politics and the Finnish political system.